Modern high-efficiency HVAC systems are expensive and you’ll want to take care of yours so it lasts as long as possible. Regular maintenance visits about every six months from your State Certified HVAC technician will ensure everything stays on track for the life of your HVAC, but there’s also some maintenance you can look out for yourself. Every year in the summer, HVAC companies’ phones ring off the hook for repairs and replacements from customers who waited until the hottest time to see how their system is faring. This is, of course, the most difficult time to get an appointment. So if you know what you can do yourself, you can help keep your unit running well and avoid those emergency summer calls for years. A typical air conditioning systems in Florida will generate about 5-gallons of condensate water daily. This water needs to be disposed of and is usually transferred outdoors through a white plastic pipe. Unfortunately, these pipes are prone to foster bacteria. This bacteria is inevitable and completely unavoidable but with a little know-how, you can help keep the water flowing. For this, we recommend using a wet/dry vacuum or a shop-vac (do not use compressed air). 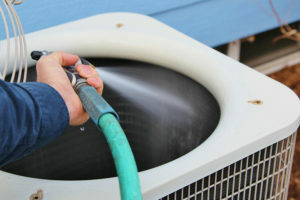 Start by locating where the drain line terminates outdoors, then attach the vacuum to the condensate drain line. (Pro-Tip, wrapping a damp shop towel around the drain line makes for an airtight seal and proper use of the vacuum’s ability.) Then, let the vacuum run for 2-3 minutes, do this at least once between biannual maintenance visits. What are the fins, anyway? Also known as the condenser coil, these cooling fins are located near or surrounding the compressor and they look a lot like a grille. Their function is to disperse the heat generated from the compressor as cool air is drawn in from the fan above. If these get dirty and clogged, often with grass clippings, your system will not run as well. To clean these fins, first, turn off your unit at the circuit breaker and the shut-off box, then you can use a garden hose (do not use a pressure washer as it’s too strong) to spray the fins as you gently wash the dirt down and through. Use of mild detergent such as dishwashing soap is ideal for this task. 3. Keep the unit clear of debris. While your system is usually in an area fairly protected from the elements, leaves, sticks, and bugs can sometimes get caught. To clean it out, first, ensure the unit is turned off at the circuit breaker and the shut-off box. Use a screwdriver to remove the fan grill from the top. You can then access the area to clean out debris using your hands or a wet/dry vacuum. Wet leaves that start to decompose can rust your HVAC so it’s best to keep the area as clear as possible. 4. Keep the area around it clear as well. Just like the unit itself, the area around your HVAC should also be kept as clear as possible. When your unit is installed it may be in a clean area, but over time, plants can grow and choke the area and leaves can pile up. If there is a lot of stuff blocking the airflow to the unit, it can be prevented from working properly. Rodents, ants and other creatures are also more likely to move in or near to your HVAC if there is a lot of ground cover and comfy nesting material all around. Keeping the area clean also makes it easier for you to reach your unit, as well as your State Certified HVAC technician when they come to perform maintenance. You may think to cover your HVAC to prevent anything from getting in. But moisture can build up inside and cause corrosion, so you don’t want the unit to be completely covered. Creatures also tend to love a covered unit more than an uncovered one and we’d rather they stay somewhere else! 5. Maintain a fresh filter. Checking a few routine maintenance activities off of your list every so often can help keep your new HVAC running well for years. It can also help reduce your maintenance and repair costs, and your energy costs as well. Even if some of this maintenance is done by your HVAC contractor, knowing what needs to be done and what maintenance is currently being done will help you stay on top of your HVAC’s status.